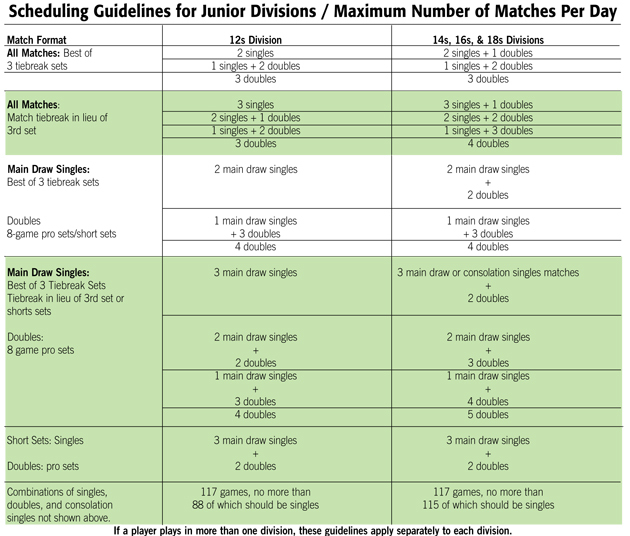 USTA Southern has reviewed the following chart of Daily Playing Limitations and approved its dissemination as GUIDELINES for tournaments. KEEP IN MIND THAT THESE ARE GUIDELINES FOR PLANNING AND RUNNING SANCTIONED TOURNAMENTS. They are intended to assist the tournaments in scheduling and promulgating a standard set of Daily Playing Limitations. The USTA Southern Section playing limitation guidelines are provided for planning and running sanctioned tournaments. They are intended to assist the tournaments in scheduling and promulgating a standard set of Daily Playing Limitations. For guidelines on scheduling, scoring etc., please refer to Friend at Court, Part 3 VI.D., page 135. After all singles matches in Junior, Adult, Senior, NTRP and Wheelchair Divisions in which the match format is two out of three standard tiebreak sets or more, the Referee shall offer a rest of two hours before the player’s next singles match. This rule does not apply to short set matches, matches that play a tiebreak in lieu of a final third set, nor to any match played indoors where the duration of the match is less than 120 minutes. For any other format (including matches played with a 10-Point Match Tiebreak in lieu of a third set), the rest is at least 30 minutes. In the 16s and 18s divisions no match should start nor should a suspended match resume after 10 p.m. NOTE: The USTA Southern Section has adopted the following: Singles matches consisting of at least two full sets (short scoring) count for Southern ranking and standing. In lieu of a third set, a match tie-break may be played to determine the winner of the match. In doubles, regular scoring, short scoring and 8 game pro sets will also count for ranking and standing purposes. Singles: A minimum of two hundred (200) points earned in the points per round system used by USTA Southern during the calendar year. A player’s best six tournaments will be counted. 15% of a player’s best six doubles tournaments will be added to the singles total for the ranking. Only points earned in the age group for ranking will be counted towards the final ranking. A minimum of one point must be earned in the Points Per Round system to appear on the Southern Standings Lists. Standings are posted weekly. Play in all upper age divisions will also count in a player’s lower age division. For example, a player who is age eligible in 12s, plays in a 14s tournament and earns points. Those same points will also go on the player’s 12s record and his 14s record. A player’s best 6 singles tournaments will be combined with 15% of the best 6 doubles tournaments to determine a standing. Beginning 1/1/15, doubles will be worth 25%.